Summary: Waterfalls are always fascinating attractions and this easy going Lake District walk visits two very different cascading forces, small compact Skelwith Force and the larger multi spouted Colwith Force. Coupled with a pleasant walk past shallow Elter Water and a brief fell climb to High Hacket this delightful circular has it all without being too challenging. As the walk never rises above 200 metres it is a very good option for walking in the Lakes when the weather closes in and with the walk not being too difficult it should be an option for many levels of fitness including senior walkers and families. Also the waterfalls are at their best after rain so pick a time to walk just after a low pressure belt has passed over the area. You will then definitely know when you are nearing one of the falls after rain for you will hear them from some distance. This is a memorable walk and one I will certainly do again. It had been raining overnight and was still doing so as I had breakfast in my Ambleside Digs. The weather forecast was not too promising either and as I ate I knew there was no chance of going onto the high fells for my last days walking on this particular visit to the lakes (I had planned to do the Coledale Horseshoe but that would have to wait until a future occasion) so out came the map. A low level walk of about five miles with lots of interesting features and preferably not too far from Ambleside were the parameters. "What is best to see after rain" I mused. 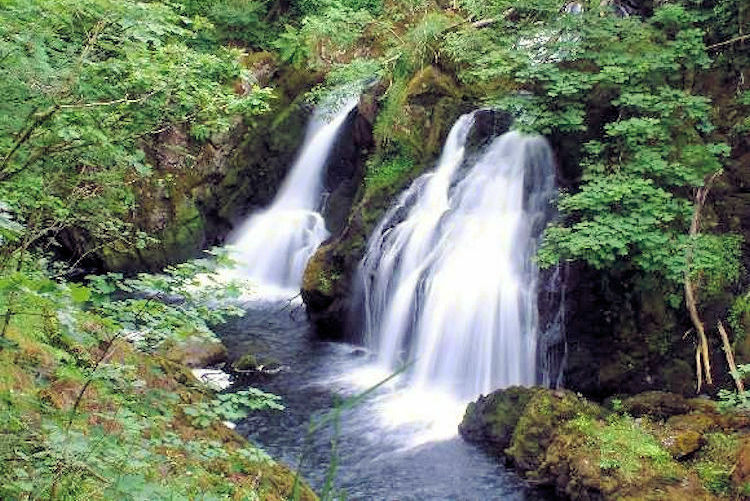 Powerful streams with water cascading from the fells soon came to mind and so I scoured the map for waterfalls. It did not take me long to spot Skelwith Force on the Explorer map for a big blue star marked its spot. A little more detailed observation was needed to find neighbouring Colwith Force. No blue star this time. Both waterfalls are marked by their name on the Ordnance Survey map though so I knew they would be significant features. A little more work was needed to link them into an interesting circular walk and by including Elter Water I retained the water theme for the hastily planned excursion. Now I was eagerly excited at getting started on my rearranged walk for the day. 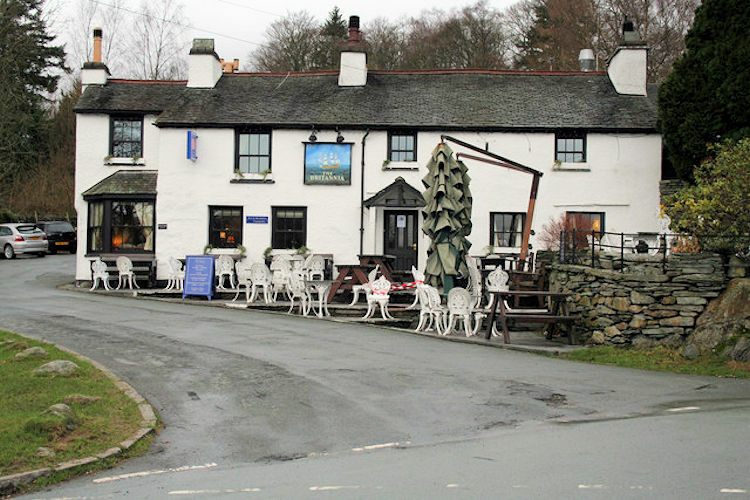 It was only a short drive from Ambleside to my starting point in Elterwater village. 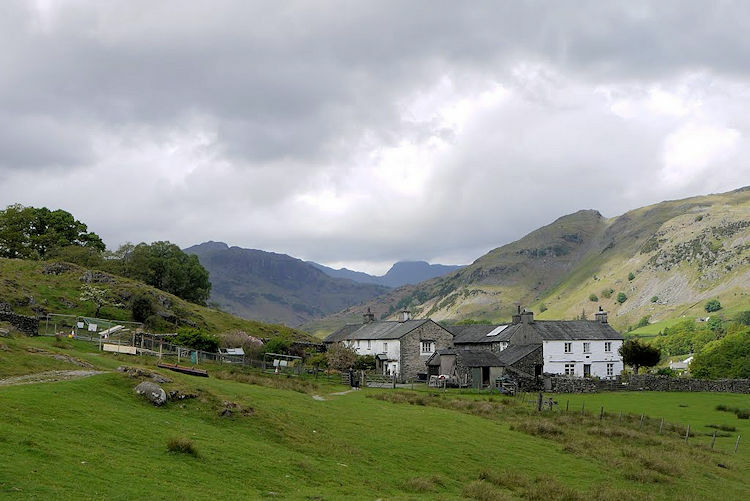 Conveniently a car park was close to the bridge spanning Great Langdale Beck. I set off on my walk, the route initially taking me east along the Cumbria Way and alongside Elter Water. 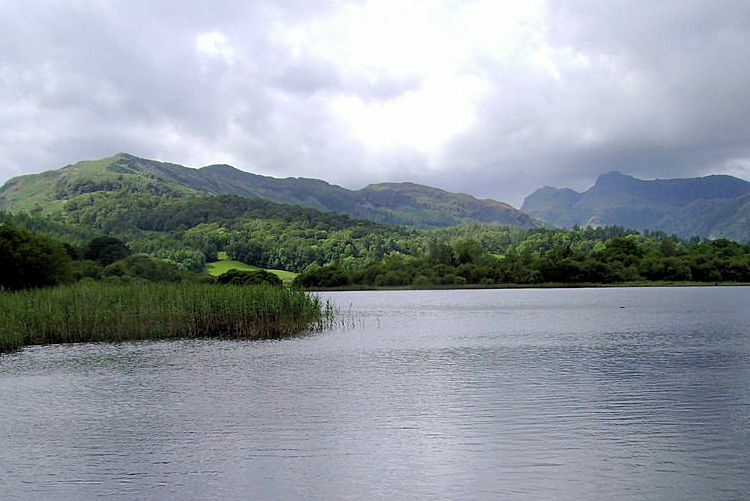 Despite the dark skies the views across the water to the Langdale Pikes were stunning. I often paused, turned ny head and looked towards them as I walked easily on towards Skelwith Bridge. 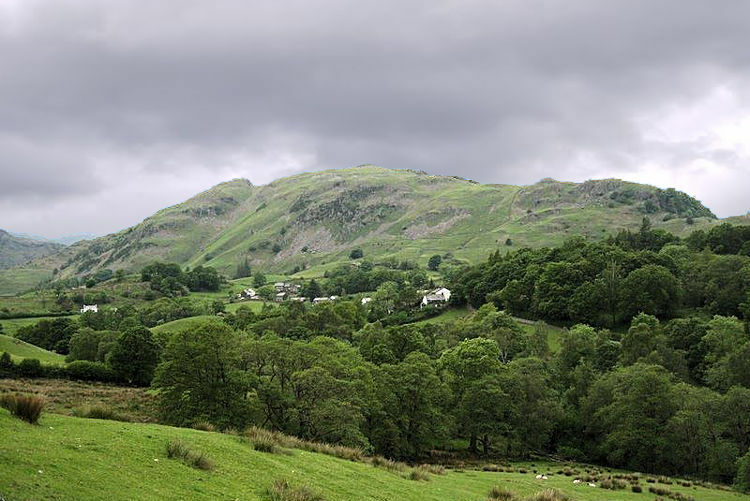 The walk linking Elterwater and Skelwith Bridge must be one of the finest short walks in Lakeland firstly winding through fields alongside the river then close by Elter Water and then through woodland. I certainly enjoyed it despite the inclement conditions with Skelwith Force being my highlight. There is something about the majesty of falling water that captures my attention. I am hooked as soon as I hear the water and drawn in like a submissive catch on the end of an anglers line. There is no fight, no resistance at all as I am lured as close as is possible to the waterfall itself. 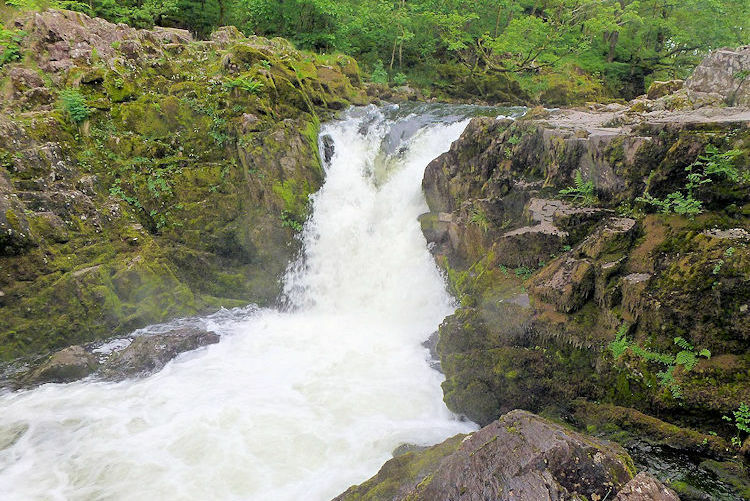 To be honest Skelwith Force was not as large as I expected given the noise that had drawn me towards it, but it was formidably powerful as the waters of the infant River Brathay were narrowed to about a metre and sent tumbling over a two metre rock ledge. The waterfall was certainly noisier than normal due to the rain and I stayed for five minutes closely watching the angry performance. It was a memorable five minutes. After the thrill of Skelwith Force I walked to Skelwith Bridge and as I arrived I walked through Kirkstone Slate Galleries. The workmanship on the slate was really impressive. I was really enjoying the walk as I left Skelwith Bridge and even more so as the rain stopped during the pleasant walking through fields towards Low Colwith. The clouds were starting to lift off the lower fell tops making the possibility of a fine end to the day. Would I see the sun before the end of my walk? After passing Park Farm I emerged from the fields onto the Langdale road which I crossed to enter Tongue Intake Plantation. An information sign told me I was entering a plantation of sessile oak. The trees were lovely to walk amidst but as before on my walk my attention was taken by the sound of rushing water. Once again I was hooked and I was quickly reeled in to Colwith Force. The force is really awesome. The waterfall drops in several stages down a total height of about 40 feet with the final double spout being the most spectacular feature. It is set in beautiful woodland making it one of the most enchanting places I have ever been in Lakeland. It is simply fantastic and undoubtably I will be back to visit Colwith Force time and time again. Thie time I stayed for ages and did not want to leave. After some time I reluctantly did so and looked back to catch its sight until it had gone. The sight but not the memory. Although an anticlimax the remaining walk over the highest part at High Hacket and then by Fletcher's Wood to follow a bridleway back to Elterwater was very enjoyable. But I couldn't get the sight of Colwith Force out of my mind. Nor did I want to.